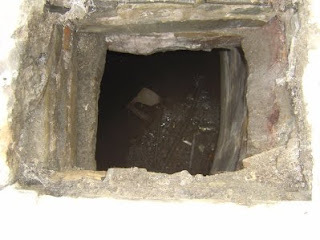 ... a deep hole!!! I didn't measure it, but most likely it's about ten feet deep, and six to seven feet in diameter. 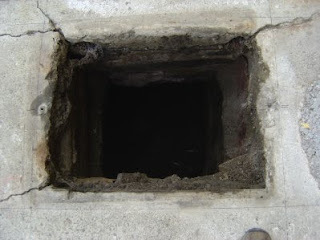 From the looks of it there are only two possibilities: It was a cistern, or a septic tank. I vote for the latter. E! 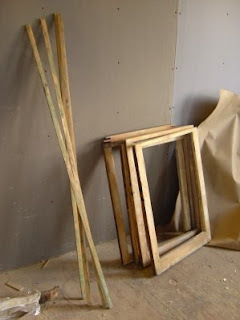 was busy stripping the window sashes for the windows in the main entrance. 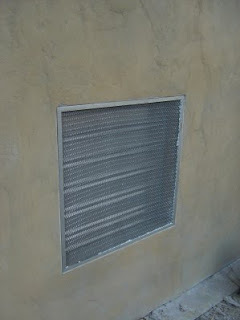 And last not least I finally built a screen for the makeup air louvers to the kitchen, it's supposed to keep evil rodents and other critters out ... we'll see how that works.